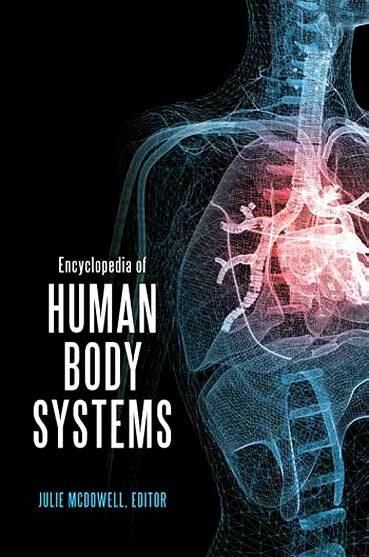 Encyclopedia of Human Body Systems /by Julie McDowell. Ligaments and lymphatic fluid. The heart and the hormone regulatory system. The respiratory and reproductive systems. The human body comprises a myriad of fascinating, complex, and efficient systems, many of which operate constantly without our knowledge or awareness—that is, until we become ill or injured. This encyclopedia provides a concise yet comprehensive introduction to each of the systems of the human body, exploring all 11 organ systems of the human body: the circulatory, digestive, endocrine, integumentary, lymphatic, muscular, nervous, reproductive, respiratory, skeletal, and urinary systems. Each chapter includes detailed descriptions of important physiological processes, cell and tissue types, as well as the organs and their roles within the larger system. Special attention is also given to the ways in which these systems interact. Written in accessible prose, this text is an easy-to-understand reference for lay readers of any age and an ideal resource for any high school health curriculum.